Dressed in cozy polka dot pajamas, this adorable bear will bring back fond memories of mornings spent surrounded by family. 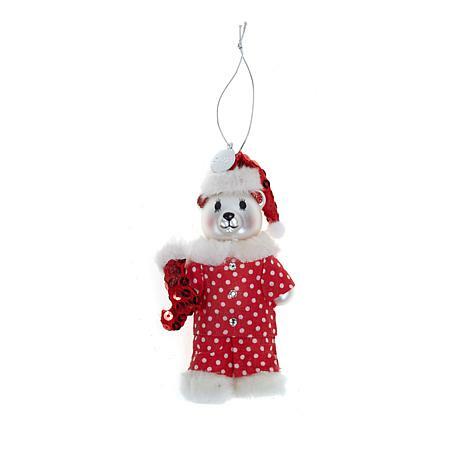 Wearing a sequined Santa hat with a matching stocking, this rosy-cheeked bear adds a hint of sparkle to your tree. And because the purchase of this ornament has charitable value, you'll get the warm and fuzzies every time you see it. This ornament is just adorable, it's even more beautiful in person, the outfit, stocking, I know when our granddaughters see it, they are going to want to put it on their tree, buying an ornament for HSN cares is great so you can help families, but you also get a special thank you with the ornament as your gift. This is sooo stinkin' cute!